Šahy, today on the border between Slovakia and Hungary, is located in the former Hont County, which for centuries was a mining region closed to Jewish settlement. The development of a Jewish community here began after 1840, when the legal obstacles to Jewish presence were rescinded. The Jewish community grew quickly, and during the decades before the Holocaust Jews formed about 15 per cent of the total population. Jews owned most local small businesses, including the Neumann printing house, the oldest in the town. After the schism in Hungarian Jewry, the community opted for the Status Quo stream. The Orthodox formed a separate community in 1876. Šahy had nearly 850 Jews in 1930; today there are only a few people in town with some sort of Jewish background. A big memorial plaque on the town's history museum lists the names of more than 900 local Holocaust victims. There are two Jewish cemeteries in town, and two former synagogues still stand in what was the Jewish quarter. 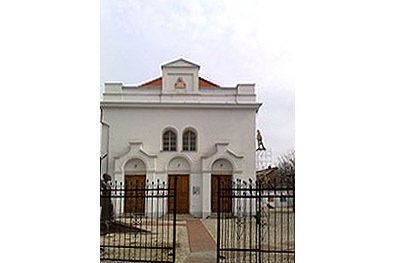 The synagogue that served the Status Quo community was built in 1852 on a small square in the town center. Its flat, white-plastered west façade has three entrance gateways and a Hebrew Psalm inscribed high above, at the roofline. Long neglected, the building was used as storage space for decades, and all of the original furnishings and interior decoration were lost. Several years ago the building was acquired by a Šahy-born psychologist, Péter Hunčík, and fully restored as a contemporary arts center run by a local foundation. Just a short walk from the town's main square, the synagogue today is an attractive venue for concerts, exhibitions and other cultural events and the lively hub of a variety of civic activities. The Orthodox synagogue, built in 1929, stands nearby. It, too, was long used as a warehouse, but there are plans now to restore it as a cultural space.